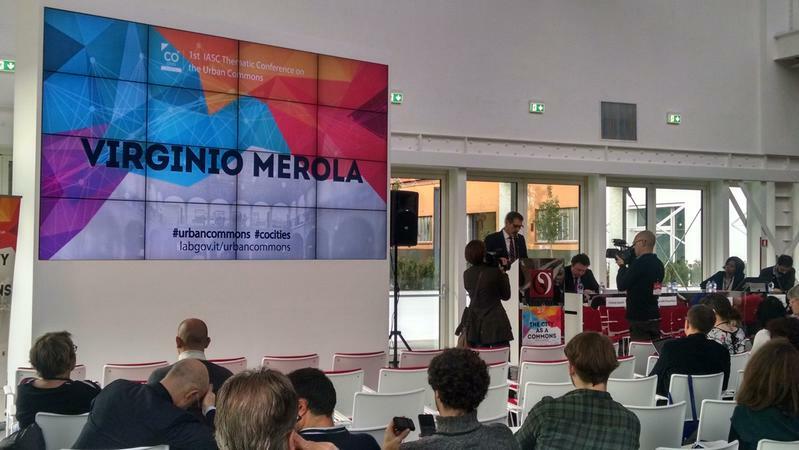 Neal Gorenflo shares his report on the recent The City as a Commons conference, held in Bologna, Italy. For more coverage on the conference, check out David Bollier’s take on the event. The City as a Commons conference broke new ground earlier this month. As the first International Association of the Study of the Commons (IASC) conference on the urban commons, it urged that the historical focus of study and action on rural natural resource commons should shift, at least somewhat, to material and immaterial commons in cities. This is appropriate now that humans have become an urban species for the first time within the last decade. However, the conference organizers, legal scholars Sheila Foster and Christian Iaione, took things even further. This was not just a call to shift the focus, but a call to recast the city in the image of the commons. The wording of the conference title was carefully considered. As co-organizer Sheila Foster has made clear, the city as a commons is a claim on the city by the people that calls for us to rethink how cities are governed and resources allocated and by whom. The city imagined as commons is a starting point that can lead to more fair, convivial and sustainable cities. While a radical proposal for cities, one well aligned to Shareable’s vision, it was well grounded in theory and practice by scholars and commons practitioners alike in the conference’s dizzying number of panels (related papers available here until December 1, 2015). Moreover, one of the goals laid out by Foster in her welcome message — to create community around the urban commons — seemed work out too. After two days of sessions and delicious Italian meals together, this diverse group seemed to jell. The conference was hosted by LabGov, the International Association for the Study of the Commons, the Fordham Law School’s Urban Law Center and LUISS University in Rome. It was appropriately held in Bologna, Italy, a historical center of urban innovation which more recently celebrated the one year anniversary of its Regulation for the Care and Regeneration of the Urban Commons, a groundbreaking new law and process empowering citizens to be hands-on city makers. The conference was bookended by two powerful keynotes, one about the past and one about the future. The opening keynote by Tine De Moor, President of the organization (IASC) Nobel Prize winner Elinor Ostrom co-founded 1989, gave a short, insightful, and sobering history of the commons. Silke Helfrich, one of the world’s most astute commons activists, closed with a keynote imagining the urban commons in 2040. De Moor’s speech outlined the long history of European commons, with a heyday starting in the 11th century and ending in the 19th when the commons were literally legislated out of existence. She warned that we should not place too high an expectation of the commons as they are revived or we risk repeating the mistake of the private property story as a one fits all solution. She urged attendees to be realistic about what can and can’t be governed by the commons. She also highlighted the revolutionary nature of the commons. She reminded us that people lost their sense of collectivity with the rise of the individual and market paradigm, and that the commons re-introduces this sensibility and way of being. She put the urban commons in historical context noting that commons rise during economic crises. Urban commons like cooperatives, associations, and credit unions are all a product of such crises. She noted a similar dynamic at work today in the Netherlands, her home. There’s been a dramatic spike in the formation of cooperatives in the last decade. Human beings are free in relatedness but never free from relationships. That’s the ontological bottom line. Relation precedes the things being related to, i.e. the actual facts, objects, situations and circumstances. Just as physics and biology are coming to see that the critical factors in their fields are relationships, not things, so it is with commons. The conference was just such an effort. I agree with commons expert David Bollier that we’ll see increasing activity in this space. People may look back at this conference as the catalyst for a powerful movement.